The study today was about building distant cloud structures with acrylic paints. I found a great reference photograph with storm clouds for lots of drama, along with a fantastic long beach that was the distance I was looking to demonstrate. The Long View, an acrylic painting (13.75 x 7.5) was painted on a hardboard using a limited palette (white, payne’s gray, alizarin, raw sienna and in very limited quantity yellow orche and hunter green) – well limited for me, lol. The long beach view was developed first, once established the cloud structures came next, then background hills and finally came the reflections (which were difficult to figure out how to do without them overwhelming the scene with too much contrast, the sand was complex enough). Thanks for checking out my latest – click onto the image for a larger view. Reference image from Steve Lyddon an awesome artist and photographer with pmp. 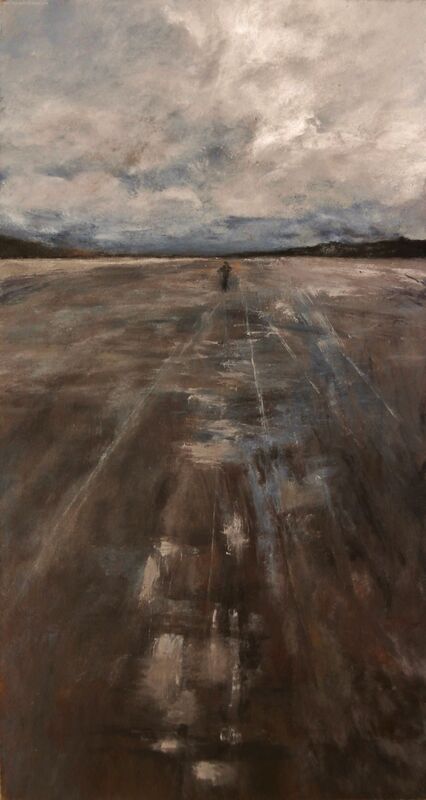 This entry was posted in Acrylic Paintings and tagged acrylic, art, beach, clouds, dusk, fine art, impressionism, impressionist, painting, reflections, stormy clouds. Bookmark the permalink. I don’t know how you do it, but you bring life to the canvas 🙂 Beautiful! Beautiful compliment Patrick, thank you so much as I learn through each color mixture, blend and stroke. And I guess the medium on which you paint matters too? Wow…I know totally nothing about painting. Thanks Patrick. Have a great weekend. I absolutely LOVE this kind of painting. Beautiful. Thank you Simla, I really appreciate it! I am incredibly enthralled by this piece, it is just amazing, and capturing, and I wish I could spend hours and hours and days and days with it – it has me in an awe-inspiring moment of mystery – like the feeling is so familiar and yet so distant – so transparent and yet so opaque and I want to dwell there until I explode, pop, incinerate – that somehow, it invites me in deeper and yet allows me to remain distant in stillness – I see my life in the emotion this painting reflects and yet it calms me from needing to find an answer or to quell any in-decidability within – is this painting what is for me to feel American an atemporal end of history, or, is it simply a reflection of a similar emotion we all must face for bridging the gap into communication, communion, into intimacy with ourselves, towards other. I could go on and on… 🙂 thank you! Wow what a write-up Orpheus – thanks so much, amazing the response this painting had on you, amazing more is how you described it. I’m happy that my work spoke to you in such a powerful way – very nice to meet you! Thank you Mary, your work is very precious! Unusual right Heath? Thanks very much – I was attracted to the scene because of its moody feel. It’s always a challenge to paint with a limited palette, you mastered it perfect! I like in particular that you utilized many shades of low key colours! Great! Thank you so much Alexandra for your response to this piece – it was very different type of scene to capture so early in learning to paint in acrylics. I did enjoy it and the scene didn’t take too long to develop once I got a feel for the paints and subject. LOVE this! Great to see you make lovely work in acrylics as well! Thanks Elena – was a steep curve to learn how to create the reflections and still show the dark tones of the beach sand. The sky was awesome to work with a brush – loved developing it. Hard to believe that it’s a painting..perfection is the word, Mary…just wonderful! Thank you Maniparna for your lovely thoughts on this piece – glad you enjoyed it! Thanks Rita, this was a spur of the moment painting and was happy that I was able to convey the drama of the scene. Love your color palette and your description of the process in creating this beautiful painting, Mary. Thank you so much Angie, really appreciate it! Ah the gorgeous colors of Fall – I’m so ready! Thank you so much Susan, I have a long ways to go and love this new journey!! You are awfully nice! I love your sketches and how they reflect a part of you ~ a beautiful diary with amazing discipline drawing each day! Wow! Okay so it’s time to ditch the OP’s! Paint is your true medium. This is wonderful. Wow Rhonda – I couldn’t possibly throw out all my OPs, there are scenes where they will make the most sense to paint with. Thank you for your very generous compliment. Sorry for my answer, I know yours was a true compliment- I didn’t word my reply very well. Thank you my dear friend, have a wonderful weekend. One of my favorites, Mary. Very existential. Thank you Prospero – I’m thrilled with your reaction to this painting. I had three scenes all selected to paint and at the last minute this one came about. Yes I can understand why “existential” came to mind. Thank you so much! Nice to meet you Adele! Thank you Laura for your beautiful thoughts on this painting ~ it was a great scene to work out. Thanks very much and ha, “the less controlled feel” is probably do to not having a good control over brush strokes yet, or fine details – lol, but I’ll take your compliment any day! You did a fabulous job on the clouds. and I love the colors you used. Thank you Kathryn for your thoughts on this painting. Acrylics is a new medium for me and am learning my way about them – I love your acrylic paintings! You have captured the distance and space so beautifully in this….I can see that you are on a roll:) Janet. Thanks Janet – this was a great scene to work out with acrylics. This is great, I love your use of colours and the reflecting water, as well as looking at the distant hills, a lovely painting! Thank you Anna – was a bit of a challenge in figuring out the reflections with paint brushes (used to using my fingers, lol), all in good time. I really love long views, and yours is wonderful. Great cloud and sky. I miss not having a sea view. I grew up with sea views. I understand – there is something very magical about living by the sea. I had the pleasure of living by the Pacific and the Atlantic – both different coast views, but soothing and peaceful. Thank you Fabio – more surprises in the wings! The large version give great feel of the long view. Beautiful! Love the long view, very nice. Thank you Lee, means a lot! The sense of distance is wonderful. Really like this piece. Thank you so much Marina. I hadn’t intended to paint this scene, but was perfect with awesome drama with those clouds – strong is a great descriptor. It is indeed a long view, totally captured and wonderfully expressed. What a fab painting for a million dollar (or more) condo! That may sound shallow, but I have reasons for thinking that. Okay, now to look up Steve Lyddon! You are too much my dear Resa – interested in your reasons!! Thank you for the wonderful compliment and trust me when I say I was totally feeling my way through this piece. Thanks again ~ have a good evening. Thank you Rachel! I wanted to let you know that I follow your blog, but your posts have not been populating my Reader – I’ll un-follow and re-follow to see if it corrects itself.